It's the moment I've been waiting for, a chance to delve into Ruby's rubbish. It's like being invited to have a nosey around somebody's house but messier! She is very brave for inviting me to have a poke around her bins and reveal her rubbish to the world, so why has she done it? It's simple really. She feels that she just has too much rubbish to cope with. Her bins are far too full on bin day and she's decided that she could do with some advice on how to recycle more. This is particularly important because when her recycling bin gets too full, her family ends up putting the rest of the recycling into the black bin, which means that stuff that could otherwise be recycled is wasted by being dumped into landfill. Ruby lives in Bury St Edmunds with her husband and two children, aged 8 and 10 and two guinea pigs. She and her husband both work full-time and mainly work from home, which might have an impact on the findings. Work is particularly busy at present because Ruby set up her own business 4 months ago and is ploughing most of her attention into getting her business off the ground, which leaves little time to think about other things. So what exactly does the Ruby household throw away? In the blue corner, we have the 240 litre recycling bin. A quick peek showed that it was full of the usual suspects, plastic packaging, paper envelopes, newspapers, egg cartons and thin cardboard. When I saw the bin, it was full to the brim and had already been compacted down. The problem was that due to a fortnightly collection there was still another week to go, with no more space to accommodate any more recycling waste. In the black corner sits the landfill bin, which can also contain 240 cubic litres of waste and is collected every other week. 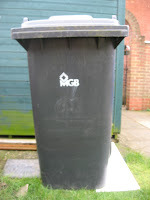 Every fortnight the black bin is full to capacity with things like aerosols, chocolate/snack wrappers, cooked food, crisp packets, fruit and vegetable peelings, plastic bags, plastic packaging such as meat trays, polystyrene, tea bags, tetra pak cartons, guinea pig bedding as well as blue bin overflow. The bin had been collected on Saturday and on that occasion it also included some DIY waste and an old toilet seat. 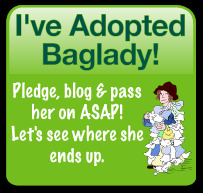 Sometimes the Ruby household also puts out an extra bag or two to be collected. 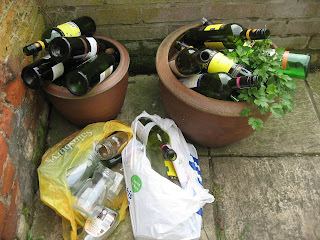 However on this occasion, it was just the one 240 litre bin. 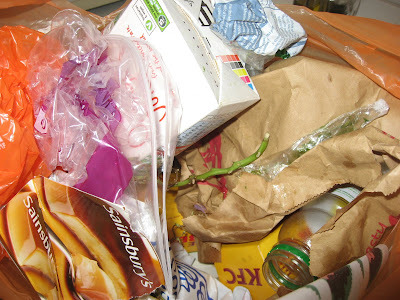 The top nasties are generally food waste from takeaway packs, guinea pig waste and other rubbish such as tetra paks and food wrapping. I can see why Ruby is concerned. That is a hell of a lot of rubbish to be dealing with every week and I am not sure whether it is any reassurance that her household is probably pretty average. One thing's for sure, this particular project is going to be more challenging than my personal Zero Waste challenge, not least because there is double the rubbish that I had to deal with, but because of Ruby's intensive work situation and not having the time to focus on some significant lifestyle changes. It certainly isn't realistic to task Ruby with a Zero Waste programme. This is neither her desire, or indeed my aim. Instead Ruby's Rubbish Diet needs to focus on reducing the amount of waste to a level that is manageable and that no longer causes her concern. 1. To reduce the black bin, so that it is only half-full on collection day. This will involve a 50% reduction in waste, which will be a tremendous result. 2. 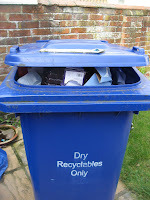 To reduce the blue bin, so that there is no excess recycling overflow spilling into the black bin. 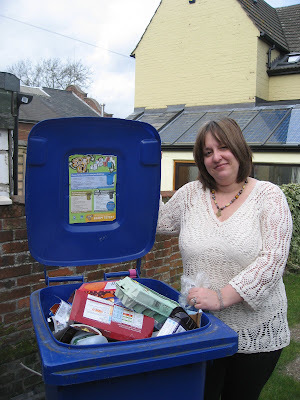 Ruby's challenge is to make a 50% reduction in recycling waste too and the results of which should mean that the blue bin will be three-quarters full on collection day, without any spillover into the black bin. a) to consider composting opportunities (either to buy a compost bin for the garden or to get hold of a brown bin from the council). 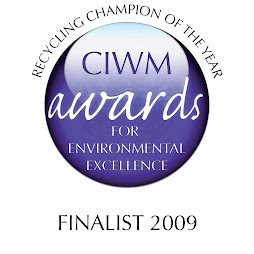 c) to get bang up-to-date with the council's local facilities and develop regular recycling routines. ..... so the next task is to put together a list of rules for Ruby to follow...and the challenge can really begin. So watch this space. I applaud Ruby for inviting you to publicly investigate her trash! There aren't many people who would feel comfortable with this. I think we'll all learn from it, though, because most of us live like Ruby and her family. Wouldn't it be nice if every household could cut their garbage output by half? Is this a new type of bottle plant in the last photo? Hi Joyce - you're absolutely right. Ruby is very brave indeed, but desperate times need desperate measures and all that. Hi FM - LOL, I'm just wondering when the party was and why I wasn't invited. After the Party: Recycling Pringles et al.